People looking for refrigerators for a garage tend to fall into two camps. The first camp wants a refrigerator that will operate properly in the extreme temperature fluctuations of an uninsulated garage. One that will not burn out in the Summer, or stop freezing food in the Winter. The second camp is thinking about the workspace. They want a fridge that will blend into the work environment, and be rugged, durable, and flexible enough to stand up to the same kind of wear and tear that the other tools and machines in the garage do. Some people fall into both camps. In this article, I list three refrigerators that will satisfy people in the first, the second, and both camps. A thermostat inside the fridge maintains the temperature by controlling a compressor (the mechanical part that causes all the humming noise your fridge makes). This compresses and pumps liquid gas (freon) through tubes and coils throughout the fridge, moving heat from the freezer section to the outside, keeping everything cold inside. A fan blows the ice-cold air from the freezer section into the refrigerator section, until it gets cold. Standard refrigerators are designed to work in the relatively moderate temperatures of your household — anywhere from about 50ºF to about 100ºF (10ºC~38ºC). Problems with your refrigerator begin when the temperature in your uninsulated garage drops to below 40ºF in the Winter, or rises to above 100ºF in the Summer. In extreme heat — 110ºF or more — the compressor works extra hard to keep everything cold. It has to make sure all that heat stays on the outside of the refrigerator. This can lead to early wear & tear on the appliance, shortening its lifespan. Additionally, the extreme difference in temperature between the inside and outside can cause moisture condensation on metal parts, resulting in rust on important components. You would think a cold garage would be fine for a refrigerator. But, extreme cold is what leads to most of the problems people have with refrigerators in their garages. The refrigerator's thermostat keeps the temperature inside the fridge at about 38-40ºF. As I mentioned above, it does this by, first, turning on the compressor to freeze the freezer section, and then, by using some of the freezing air from the freezer to keep the main section cool. When the outside temperature drops to below that 38-40º, the thermostat is less likely to turn on the compressor, because the inside and outside temperatures are the same, and it's “happy”. With the compressor off, the freezer section won't be getting heat removed to keep its temperature below freezing. Which means stuff in it will start to thaw, and then, spoil. When your garage temperature drops even further to below freezing (32ºF), the inside of the fridge will also drop to below freezing, so everything in the freezer section will be frozen — which is fine — but, everything in the refrigerator section will start to freeze, too. Vegetables and fruits, drinks, and other things will be ruined because they will be frozen. DIY Tip: I recently discovered that you might create a controlled-temperature environment for your garage refrigerator by creating a special room or compartment within your garage for it. I talk a little about that idea here. So, your ideal garage refrigerator freezer will be designed to operate at subfreezing temperatures in the Winter, and/or extreme heat above 100ºF in the Summer, depending on where you live and the conditions of your garage. Before purchasing a refrigerator for your garage, be sure to download the owner's manual from the manufacturer's website or your online shop, and check the operating temperature range (usually found in the installation section). Make sure it matches your needs and the conditions in your garage. Note: It is also possible to convert your current standard refrigerator to be “garage-ready” by installing a garage refrigerator kit on your fridge. See the end of this article for details. Ok, now that we have all that technical stuff out of the way, let's look at a few refrigerators. Here are my 3 suggestions for garage ready refrigerators that will either blend into your workspace, handle extreme temperatures, or both. The industry has changed a bit since I first wrote this article. Truly “garage ready” refrigerator freezers seem to be much harder to find, as companies probably cut costs in production, and more people put refrigerators in garages in a wider range of climates — stretching the legal definition of what “garage ready” means, and forcing companies to try to satisfy a more general demand. Two of my original recommendations had to be replaced here. However, I have left them in the post so that you can see what made them good, and maybe even seek them out as used or refurbished. 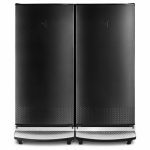 The Summit FF1511SS (and its counterpart, the Summit FF1512SSIM which has a built-in ice maker) boasts a roomy yet compact design originally intended for smaller apartments. However, that design, combined with its ability to handle a colder environment make it a good fit for a crowded garage. 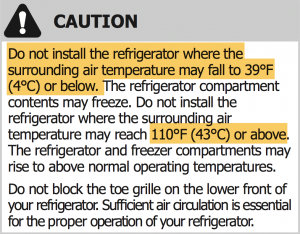 The manual states this fridge can be installed in temperatures as low as 23ºF (-5ºC). It also has separate thermostats for the refrigerator and freezer compartments, controlled by a slick digital panel in the wall of the fridge. Reviewers online find it very spacious for its size. It includes a large standard-for-the-home vegetable drawer, adjustable shelves, door shelves with space enough for taller bottles, frost-free operation, and a reversible door (so that it will fit properly in the desired corner of your garage, without awkwardly opening on the wrong side). Some of the more unusual features aside from the digital control panel include a sealed back for easier cleaning, LED lighting, an open-door alarm, and a strange (to ME, anyway) “vacation setting” which will turn off certain features while you're away. The Gladiator Chillerator Garage Refrigerator was probably the most popular result you used to find when searching for a garage refrigerator online. And rightly so: It satisfied the needs of both camps. Unfortunately, Whirlpool discontinued the model. However, I continue to see it sold online used or refurbished, so I think it's still worth mentioning here. 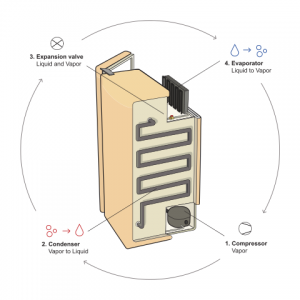 The Chillerator was designed to work in a wider range of ambient temperatures than a standard refrigerator. The manual states the operational range as 0ºF~115ºF (-17ºC~43ºC). It will work properly in all but the coldest of subzero Winters, and hottest of Summers. The sturdy, heavy-duty design makes it a good fit in a workman's garage, and wheels on the bottom allow you to easily move it around or out of the way for convenience. It comes with the same standard features you'd expect in a home fridge, such as self-monitoring defrost, ice-maker, fruit and vegetable drawers, and a drink-caddy. In a few reviews online, a number of people complained that the refrigerator section was not cold enough, but at the same time, they also praised Gladiator's Customer Support for addressing their concerns fairly and promptly. While the Chillerator can be a bit pricey, it does deliver what most people expect from a garage refrigerator. As the name suggests, the Frigidaire FFRU17B2QW Refrigerator has no freezer. That might be a drawback for some, but this actually gives it a few advantages over the standard refrigerator-freezer. First of all, with the freezer gone there's the extra space available for items you simply want refrigerated, and not frozen. With a total of 5 shelves (4 adjustable) and 5 full width door racks for bottles, jars, and other small items, this freezerless refrigerator is perfect for storing all your extra food items out of the way. Additionally, without a freezer, there's no need to compensate for the dual functions of freezing and refrigerating with separate thermostats. The refrigerator can be optimized to operate in a wider range of temperatures. As a matter of fact, the Frigidaire FFRU17B2QW also adds what they call their Freeze Control Feature, which is what makes it particularly “Garage-Friendly”. This feature maintains proper refrigerator temperature even when the garage temperature drops down to as low as 10°F (-12°C), or as high as 110°F (43°C). Some reviewers complain that the door seal can sometimes require extra force to open, due to the the vacuum created by the temperature difference between the fridge and the room/garage. Personally, I don't mind a solidly sealed fridge, and you can use your finger to push and shift the seal slightly, releasing the vacuum and allowing the door to open more easily. Frigidaire used to make several lines of refrigerators that they designed and marketed as “garage-ready”— able to work in temperatures below 55ºF. I selected the FFTR1821 series because of the balance of size, price, features, and good online ratings. Frigidaire has since changed the design of the FFTR1821 series, and they no longer market it as “garage ready”. While the manual states that it can work in temperatures as low as 39ºF, some installation instructions say not to place it in areas below 55ºF. The manual (click here) also states that a garage kit will only bring the minimum operating temperature of your unit down to 34°F. Its “garage-readiness” was partially accomplished by putting separate thermostats in both the refrigerator and freezer sections. The freezer's coldest setting was also labeled “garage”. At this setting, the compressor would still turn on in colder ambient temperatures so the freezer keeps everything frozen. The FFTR1821 continues to offer more than what you'd expect from the average family kitchen refrigerator. Sliding shelves for easy access, humidity-controlled crisper bins, a deli/meat drawer, and a dairy bin make it a desirable package. One drawback is the lack of an ice-maker. A common complaint about the fridge is that it is loud when the compressor turns on. Despite this, people still gave it 4 out of 5 stars. The FFTR1821 comes in 4 colors: black, white, misty silver, and stainless steel. 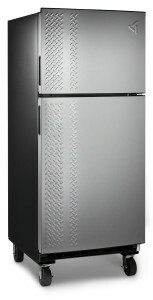 A few years after discontinuing the Gladiator Chillerator, mentioned above, Whirlpool Gladiator Garageworks came back with another garage ready refrigerator option, redesigned from the ground up. 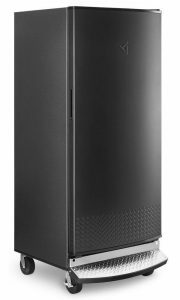 The new design removes the freezer (the freezer is now a separate unit—see below) which expands the storage space, and allows for other functionality in this sleek-looking, all-black appliance. As far as function goes, the first feature that stands out is the “Step-to-Open” pedal at the bottom of each unit. Got your hands full? Just walk up to the fridge, step on the pedal, and the door opens up to let you put your groceries in. It has and equally sturdy, heavy-duty design as its predecessor, making it a good fit in any workman's garage. 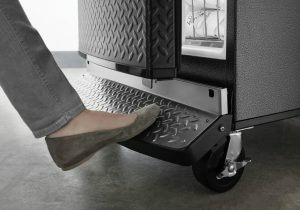 Wheels on the bottom allow you to move it around or out of the way easily for convenience. 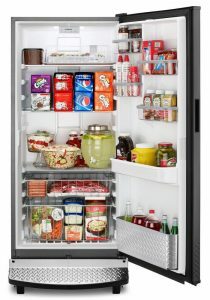 Standing 30-inches wide, the Gladiator Garage Refrigerator boasts 17.8 cu. ft. of storage space, with adjustable, extra-thick heavy-duty glass shelves that can handle the weight of eight 12-pack of cans. Slide-out heavy-guage wire baskets allow storage for items that are difficult to store on freezer shelves. Here's an important note. Unlike its predecessor, the Chillerator, this refrigerator is not designed to preserve food in sub-freezing temperatures. “If using the refrigerator in an area having temperatures that fall below your refrigerator's internal temperature setting, the internal temperature of the refrigerator will drop. This is why this new design is listed here under the “Second Camp” — for it's sturdiness. As I mentioned, the new design separates the refrigerator and freezer into two separate units. When placed together, these two all-black appliances make for a striking presence in your garage. It's a cool look that really stands out. This refrigerator, my initial recommendation for this category, is a really fun option for keeping drinks in your garage work area. Unfortunately, it's not so easily available any more. 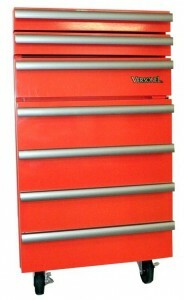 The Versonel Portable Garage Toolbox/Toolchest Refrigerator is designed to blend into the garage environment by looking like a chest of tool drawers. Actually, it DOUBLES as a tool chest: Just above the refrigerator door are two drawers you can use to store tools. Castors built into the base allow you to easily move it around your workshop. The wheels can lock to prevent rolling, but don't allow you to level the refrigerator. This fridge is smaller than the ones above. At just over 2½ feet high, it's not designed to store much more than drinks and smaller food items, and doesn't have a freezer compartment. The shelf is adjustable to give some flexibility is storage options. 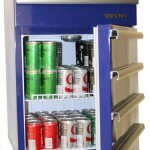 The Versonel Portable Garage Toolbox Refrigerator also comes in blue. If you're searching for a refrigerator that will work in extremely cold temperatures in your garage, you might not need to buy a whole new refrigerator. It could be that you just need a Garage Refrigerator Kit. A refrigerator garage kit is essentially a small heater that, when installed, tricks the thermostat in the fridge into running your compressor so that your freezer keeps your freezer items frozen. The kits come with instructions, and are relatively easy to install. However, I don't recommend doing it yourself if you are uncomfortable or unfamiliar with basic wiring or taking apart the control box of your fridge. Kits cost about$20-30, and are usually designed with specific brands in mind. 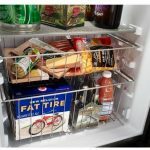 They can, however, be adapted to fit a variety of brands, and are an extremely affordable way to convert your current home fridge into a garage-ready refrigerator. Note: In particularly freezing temperatures (closer to 0ºF and below), you might need to heat the compressor itself to prevent the freon gas from becoming a liquid. The compressor cannot pump liquid freon properly. It only pumps freon in it’s gaseous state. In freezing garages it might be necessary to install a Self Regulating Crankcase Heater on the compressor. So… workspace, ambient temperature, and functionality are all factors to consider when looking for the best refrigerator for a garage. But, you should be now well-equipped and informed about how to balance those factors out when selecting a fridge. I hope that these three options will give you a good start towards finding the best garage refrigerator for you. If you have any questions, or even suggestions for other refrigerators for a garage, please add them to the comments below. I look forward to hearing from you. Disclosure: 3GoodOnes.com is a professional review site. Some of the links in the post above are “affiliate links.” This means if you click on the link and purchase the item, I will receive an affiliate commission for your purchase. It is my hope that this post leaves you so well informed, that you won't mind that very much. Wow! Very good article! I didn’t know there where specific garage refrigerator. I will think about it, I’ll stop going up 2 floors to grab a cold beer when I’m working in my garage! I think the Versonel Portable Garage Toolbox Refrigerator is good if you want to hide your beers to your wife! Thank you, Gorge, for stopping by and reading. I hope it was helpful. 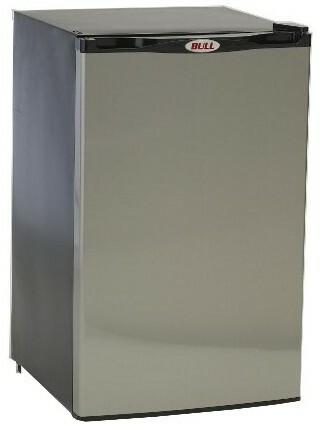 Hi, do you think that the The Gladiator Chillerator Garage Refrigerator can be used in Mexico? I certainly think it could be! I know Mexico is famous for being beautiful and warm, and I’m know some areas can get extremely hot, but I’m sure some can get particularly cold — such as the desert at night. The only considerations I can imagine getting in the way are legal regulations. But, being in North America, I’m sure you could still pick one up and get it working. Thanks for taking the time to put this together. My wife found it when looking up “garage ready” refrigerators after a salesman said that was what we needed to replace the one in our garage. (She doesn’t trust much that salesmen say when they smell a possible sale -she used to work at car dealerships.) It turns out the Frigidaire was the exact model we had settled on. I guess there is a mfr deal for the holidays, since we were quoted the same price at Loews – with free delivery. I was going to buy it through the link in your article, since they (BestBuy) advertised free delivery, but free delivery isn’t available to our zip code, even though we’re only about 15-20 minutes from a Best Buy(?). A side note: I bought a “Kill A Watt” meter a few years back (a lot of fun to use, but I don’t keep good records), and it indicates we should save about $100 per year if we use it instead of the 30-yr old one in our garage vs. the $0.12/kwh rate on the new appliance tag. I won’t mention to my wife that is a little biased by using the meter during this past relatively warm month. Also, new refrigerators aren’t famous for lasting 30 yrs – or more. We’ve grown used to having the old unit in the last year or so, usually stopping there first after a trip from the store, dropping off sale items not quite needed in the kitchen. Also, we can now keep more beverages cooled ahead of time, however, as you pointed out, the freezer is pretty useless in the winter. If not for the energy savings, I would seriously consider the kit you talked about. Thanks again for a very satisfying article. I’m glad you found the article helpful enough to make a comment! Thank you, and you’re welcome. Sorry it took so long to reply to you. I sure don’t get why your zip didn’t get the free shipping, but I’m happy if you found an alternative and are satisfied with it. Good luck with your new garage fridge! can i put a fridge garage kit on a maytag ? It’s possible to install the garage kit on most refrigerators, regardless of make and model. However, if you’re unsure of how to do this, I recommend hiring a certified technician. If it’s a refrigerator-only unit (or freezer-only) you won’t have the problems that arise from sharing the same cooling system. You can have separate units, or separate thermostats. Either way, you avoid the thawing/re-freezing problem. However, you still have to be sure, that the fridge or freezer unit is designed to handle the temperature extremes that your garage goes through from Summer to Winter. Particularly if the change is drastic in your area. Thanks for all this good information Scott. I found it very interesting, especially the technical stuff at the beginning. I knew that garage refrigerators existed but I didn’t know about the kits to make an existing refrigerator into a garage refrigerator. I have a 25+ year old side by side GE that has never given us any trouble but is now starting to moan and groan a bit. I wonder if its days are numbered. I am thinking of installing a kit in the old GE and putting it in the garage, then buying a standard refrigerator to replace it in the kitchen. My question is: Do you think I would be able to use the garage kit on such an old refrigerator? You’re welcome, Terry. I’m glad if it’s helpful. As you might glean from my article, Garage Kits can be a little tricky. You’ll have to find one designed for your particular fridge, for one. Then, you’ll have to consider the temperature fluctuations in your garage. If you don’t have the original manual with the specs of your fridge, or can’t find it online, it might be worth testing it out in your garage for a year, so you can see how well it works through the different seasons. Check how consistent it keeps your food temperature, and listen for how hard the compressor is working. As I mention, I don’t recommend doing it yourself, and suggest you get assistance from your local professional, who can examine and test the fridge in person. We have a fridg only in our heated garage. Keeps things plenty cold in the winter but not so cold in the summer. We have put up with it for two years. Going to switch to a garage fridg soon. Probably the Gladiator. Thanks for your comment. I would appreciate it if you would come back and tell us how the fridge worked out for you, so that other readers can benefit from your experience. Good Luck finding a Gladiator. They discontinued that model. Mine is 14 years old and working great. I hope it does not break…. Yeah, I’ve had to update my post to reflect this information. I often still see the Gladiator being sold as refurbished online. Sears is one resource for that. Please do not recommend the The Gladiator Chillerator Garage Refrigerator ….. biggest piece of junk on the market. Over priced and fails early, just check the reviews on amazon. I’ve seen the reviews around the internet, and they are both good and bad. Almost everyone who complained said that their issues were resolved by Whirlpool’s customer service. Did you have an experience with the Chillerator you would care to share that might help other readers make an informed decision? I understand the concept, but what if the garage temperature drops to 20 degrees or even lower….what prevents the refrigerator portion from freezing? First, the insulation of the refrigerator will keep the insides isolated from the outside — keeping the heat out and the cold in. Or, in THIS case, the regular-cold in, and the freezing-cold out. But also, having different thermostats in the freezer and refrigerator sections will keep the compressor from turning on when the fridge is already cold enough. However, keeping things above freezing in extreme cold temperatures is not what refrigerators are designed to do. 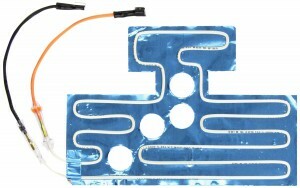 And you might want to find a different solution that insulates your items from the extreme cold without heating it up. You can read a little more in this article I wrote about Garage refrigerator freezers. I hope that helps! Thanks for reading, RG. We bought a Whirlpool “convertible” Refrigerator/Freezer 4 years ago for the garage. We only needed a frige. We are in the NE with cold winters but besides doors being left open now and then, the garage stays over 45. We did not have an issue w/ the freezer of course. But it died last week. 3 years out of warranty but like brand new. We paid a repair guy $90 to tell us it wouldn’t pay to repair. Probably either the compressor or a leak. Almost the same to buy a new one. So Scott, your last paragraph talks about a unit that handles the extreme temps. I do not see any specifics about this here or elsewhere. We only saw that Gladiator but dont need a freezer,. So, I wasn’t referring to a specific unit in that paragraph. I was talking about adapting a unit to work in extreme temperatures. There are Refrigerator Garage Kits available to kind of retrofit various makes of refrigerators so that they will work in colder temperatures. As I mention, it essentially “tricks” the thermostat into thinking it’s warmer in the garage, insuring that the compressor kicks in to keep the fridge cold. Take a peek online, to see what brands these kits are made for, and maybe make your decision from there. And, please come back and tell us how it worked out! I hope that was helpful. Thanks for stopping by the site! 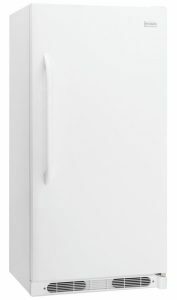 Frigidaire makes a convertible refrigerator/freezer 17cu and 20cu that is garage ready they come in white and smudge proof stainless steel. The 17cu also comes in Moosy Oak Country camouflage. They can be found at Lowe’s. I’m going to look into this and perhaps write an article about convertible refrigerator/freezers. Thank you for sharing this and contributing to the article. Great explanation. I did have one question. If i get a refrigerator with 2 separate, digital thermostats (for the freezer and fridge). Will it keep my freezer stuff frozen when the garage hits 30-40 degrees? Or will it shut off entirely? And there is no built in heater to warm up the refrigerator section if the ambient temp goes down into the 20s? I just read the online manual and it says do not install below 55 degrees. I’m guessing that is my answer..
You have the right idea. Dual thermostats will help maintain freezing temperatures in the freezer section, and keep the refrigerator less than frozen. However, if the temperature drops to extreme sub-freezing temperatures — like in the 20s, as you mention — there is no heating element to warm it up. The workings of refrigerators is that they remove heat, not add it. That’s just how they are designed. In such cases, you’d be relying on the insulation of the fridge to keep the freezing cold temperatures of the garage at bay. As for the Kenmore model you picked out, you’re right: that’s your answer right there. It’s not designed to work in colder temperatures. You might, however, consider adding a refrigerator garage kit, as I mention in the article. to help it in colder temps. See if you can find one built for Kenmore, and enlist the help of a local technician to make sure it’s installed correctly. PS: I’m currently doing some research to find more garage-ready refrigerators to compare and recommend. I’ll be sure to add the link here when I’ve posted my results! It certainly IS difficult to find a good selection of garage-ready refrigerators to compare. I’m actually in the middle of doing some research now to create a list for people to work with. Please stop by the page again in another month, and hopefully I’ll have it up. I’ll be sure to reply again with the link when it’s done. Thanks for stopping by and reading. Congrats on refinishing your garage! I hope the Frigidaire works out for you. I’m sorry you’re having so much trouble. The fact that you had the same problem with two different refrigerators in the same space leads me to suspect 2 possible causes. First, it sounds like the ambient temperature of the garage is ok, but when you install the fridge, are you allowing enough clearance for air to get to the coils in the back? 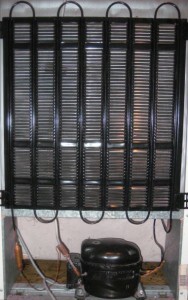 The coils need to be exposed to the air in the room to adequately remove heat from inside the fridge. Space on the sides and back allow for the air to circulate and help keep the fridge cool. Installing your fridge in a cabinet or tightly closed space will inhibit circulation and prevent the unit from cooling properly. check your manual for the proper clearance. Second, what are you putting inside the fridge? The items you put in the refrigerator actually help the refrigerator maintain a steady temperature — kind of like how ice cubes help keep a drink cold. Containers of liquid, food, etc. The more items you have in the refrigerator, the less work it needs to do to maintain the temperature when you open and close the door (letting warm air in). I hope this gives you some direction in resolving your issues. Thanks for stopping by the site for information. I REALLY regret not having read this article sooner. I think we junked a perfectly good fridge/freezer… (insert face palm) Now I’m looking for a replacement. Great article. Thank you. Scott, thanks for educating us about the issues with putting a fridge in the garage. Regarding the Frigidaire FFTR1821QW, how did you determine that it is suitable for garages? According to page 15 of the manual (excerpted below), it is not suitable for garages unless you install a special kit. rise above 110°F (43°C). The compressor will not be able to maintain proper temperatures inside the refrigerator. freezer temperature problems during the winter months when temperatures dip below 55° F. Upgrading your refrigerator with a Garage Kit will lower the minimum operating temperature of your unit to 34° F. This kit can be ordered by calling the phone number listed at the bottom of the warranty page or back cover at an additional cost. Thanks to you and other alert readers, I had to redo my research, and found that both the design of this model and the marketing had changed since my original post. You would think that Frigidaire would have changed the model number! I have updated my post to reflect those changes, and posted a new recommendation in its place. I hope that you and others find this helpful. I appreciate you reading the article and adding to the discussion. Sorry that it took a while to reply. Well, it depends. As you can see with my latest update to the posting, I DO have a freezerless refrigerator as a recommendation. However, not ALL freezerless refrigerators are designed to work in extreme temperatures. In my research, it seems to me that the convertible refrigerator/freezers seem to be most likely to work in sub-freezing temperatures. Always check the installation instructions first. I hope that helps. I’ll try to add some more freezerless refrigerator options in my next post on the subject. Thanks for stopping by and commenting! You put a lot of thinking in this article, that is impressive. Thank you for sharing. Hello! I read this article in the course of my research, and feel the need to comment, as I have updated info that could help people. First off, the Gladiator Chillerator has been discontinued! As of this writing (7/3/17), perhaps there are some left out there somewhere; I have not checked. Second, after searching far and wide for something that will work for our application (3-season cottage where the temps in spring/fall can fall into the 30’s) I am being told by multiple knowledgeable salespeople and techs that there is NOTHING sold anymore that is ‘garage ready’. I was shopping Frigidaire, and their documentation is incredibly inconsistent. 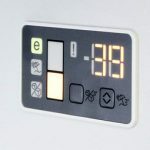 For ALL of the models I looked at (Frigidaire’s website), when the Owners Guide (not necessarily model specific) said that the unit could be run in ambient temps as low as 39 degrees, the Product Specifications Sheet (which is model specific) always said that it shouldn’t be run at less than 55. After consulting Frigidaire, they said we should pay attention to the Specs Sheet. So, for my situation specifically we’re SOL, except perhaps to have a fridge only in the living space and a chest freezer in the shed. Sad but true. Hope this all helps! Yes, I have been researching the topic again recently, and am updating the article accordingly. I appreciate your input, and that of the other readers that have reached out to me. I need a new refrigerator and my kitchen gets extremely hot – 95 degrees and over in the summer. Would a garage-ready refrigerator be a good choice inside? The one I just got (a GE top freezer), has a wide temperature range – the freezer has gone from -10 to 15 degrees in just a few hours – and it’s not even hot here, yet! We’re in the 70’s. Any suggestions for stabilizing the temperature? Hard to make a suggestion without more details about the fridge and the conditions, but that doesn’t sound like a problem, necessarily. If you’re saying that the temperature changed about 10 or 15 degrees, as long as it is still well below freezing (below 0º is usually recommended), the food in the freezer section should all remain safely frozen. Is the unit installed properly, with enough space for air circulation around your refrigerator? You usually need a couple inches of space along the sides, back, and top for air to circulate and for the compressor to work. If it’s installed in a tight space with no air circulation around it, that could be preventing it from cooling down properly. Is the freezer stuffed to capacity? Is there room for air to circulate inside the freezer? This is important for proper functionality as well. Have you been putting hot or warm things into it? This will also immediately raise the temperature inside the freezer while the compressor works to even out the temperature and bring it back down to normal operating range. I hope that helps! I’ve updated this post as well as my answer to your post on my other page. Message me again if you have any further questions. I can’t really speak to why manufacturing practices have change. I can only guess that it is fueled by money. Maybe the demand for fridges that work in colder temperatures is not enough to justify the cost of making them. However, I still see that there are several refrigerators being made that WILL work in colder temperatures — they are just not being marketed as “garage ready” any more. I imagine that they can’t legally say that a fridge is “garage ready” because it suggests it will work in ALL garages, regardless of where your garage is. One phrase I’m coming across in my searches now is “garage-friendly”. Your guess is as good as mine about why this might be better. I haven’t had a negative experience with Frigidaire myself, but I appreciate you sharing yours. Perhaps if more people contact their customer support, they will put a little more effort into providing helpful answers about their products. Thank you for reading the article and writing to share your thoughts! I was told that there is divice that you can screw into the light bulb socket in the refrigerator to make the refrigerator garage ready. I have a GE model gte16dthcrww. I have never heard of such a device. But, if it exists, I can that imagine that it would only work to heat up the inside of the fridge so that food won’t freeze in particularly harsh winter. I can’t see how it would fix the issue of the compressor operating in extreme cold or heat. If you can find more details about this, please come back and post it, and I will look into it further. It’s definitely possible. There are many ways to go about it, and you can find some interesting methods online. You might need to incorporate a cooling device — a fan at the minimum. I mention one DIY (do-it-yourself) method on this page. If you find something that works well for you, please come back and tell us about it! I have a Whirlpool side by side that I put in the garage- Indianapolis garage temps aren’t bad, but it’s enough to shut off the compressor and ruin anything in the freezer. Has anyone added a “garage kit” to one of these? I only see Frigidaire kits online. It’s stainless and otherwise works great- I hate to junk it. Thanks for the information and your recommendations. I live in CT so my concern is cold temperatures. I like your recommended Frigidaire FFRU17B2QW Refrigerator for my unheated garage but have a question. I think it should work OK and I checked the owners manual and it does not have a low ambient temperature limitation. But my question is: can I turn off the refrigerator when it is not in use or must it be left on so that certain components are heated? The Freeze Control Feature will maintain proper interior temperature even when the unit is placed in an area where the surrounding temperature drops down to 10° F (-12° C). This is the number on which I based the temperature range, and my rating. I hope that helps! I’m currently shopping for a garage refrigerator and I’ve found Sears sells several Kenmore models they claim are garage ready. I’m surprised you haven’t mentioned that brand. Is there a reason you haven’t mentioned Kenmore? The only reason I didn’t mention Kenmore is that I was limiting the article to 3 options, and these were the most representative at the time. 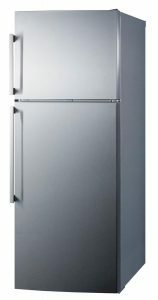 However, I have since published a new article: MORE Good Garage-Ready Refrigerators, with many Kenmore options listed. I got so many requests for more options on THIS article, that I decided to go on a quest for more. Check that article out here, and let me know if you think there more that I should list. Very good video ! Thank you for the information. You’re welcome! I’m glad if it was helpful. Thanks for stopping by! So frustrating….I really could use a second refrigerator which I would want in my garage. I do have a basement but want to avoid hauling heavy trays of food etc. up and down the stairs. Large party trays, cakes, beverages would all be difficult. Also, I noticed the refrigerators in this article are either discontinued or don’t have freezers….ugh. When I make large pots of soup I need to be able to put then into smaller containers and freeze them. I need to be able to freeze tamales during the holidays. Help! Sorry you are struggling to find something for your situation. Since you are looking for freezer options, you might find this new article I published helpful. It has a list of freezers of various sizes and prices to look at. Check it out. Thank you very much for so much good info. My parents bought a fridge from Sears to put in garage and found out the hard way that not all work for that. Mom is most interested in the freezing section for the ice maker use. Loves her crushed ice. Sears has said they will accept return of it and she can pick another. The kit didn’t work on one she has according to the repairman they sent out. Thanks for the models mentioned. Good place to start. In the area we live below 30° is rare but at or above common. I’m glad you found the information helpful. I’ve recently published another article here with more models to consider. Scott. I live in Pa. 5 months (May to Sept.) every year. I have a 12 x 16 ft. shed which is new, and I would like to put a refrigerator in it to be used only during the summer months. Our home is located about 65yds from a lake so we do get some nice breezes off the water but the shed gets quite hot during the high temps days. 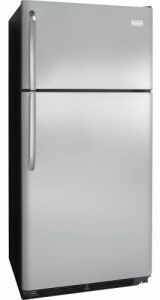 Would turning the unit off during those very hot days shorten the life of the fridge. We were planning on turning the fridge off whenever we leave for Fl. in Sept and turning it back on when we return in May if that’s OK to do. Thanks for any info you can give us. Unplugging the unit on those hot days shouldn’t damage the unit. As long as you’re not unplugging it and plugging it back in several times a day. Waiting several hours between plugging and unplugging should be fine. I also recommend checking the temperature inside the shed on a hot day without the fridge, and keep in mind that running the refrigerator will actually make it hotter. The heat from the fridge has to go somewhere, so you might want to consider additional ventilation for the shed. I hope that helps! Thanks for reading and commenting. 3 Good Ones… Copyright © 2019.